By the great feathers of Crazy Horse, we had some great Indian food tonight! The name of the place was Memories of India, and it did, indeed, stir up a great reminiscince for the days of Indian food in the old country. 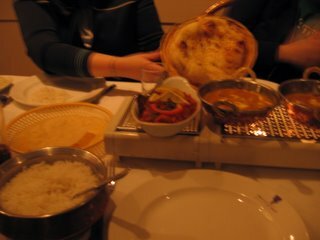 Indian food fulfilled these desires, luckily. 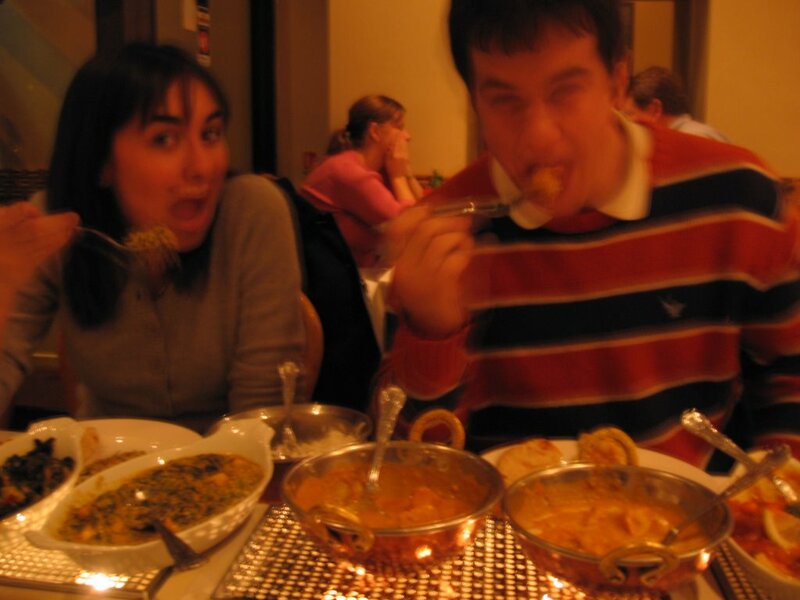 So, on this, the third leg of the Great London Culinary Mission (yesterday, we devoured a sandwich that involved the flanking of tomato, mozzarella and basil with two slabs of panini, slung to us by a great Armenian man who said he would have given us better service if we were not male), we waltzed into a completely empty Indian place. It had Zagat Survey ads from 1984 in the window. So we knew that it was good even before we were born. The characters: Darcey, Alyce, Catherine, Kelly Travers (one of those people who exist best with multiple names, such as Phillip Seymour Hoffman or Prince William) and myself. Until around the 20-minute mark of being in the restaurant, the only sounds that broke through the crystalline silence came from the occasional clink of a glass being cleaned at the bar. Eventually, we had the audacity to converse but Alyce and I had not the gall to order anything outside of Chicken Tikka Masala. 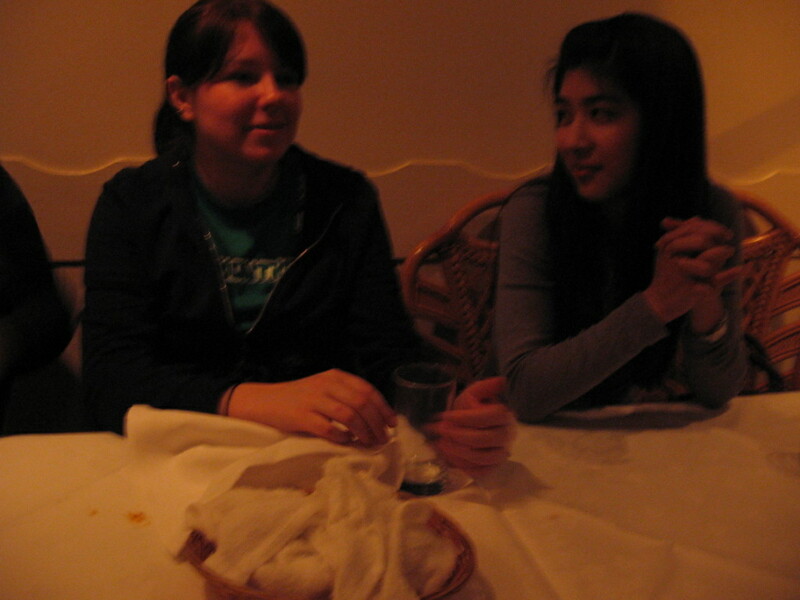 Kelly Travers (left) and Alyce hang out behind a piece of garlic nan and some masala and rice. Darcey and I raise a fork for love and for nutrition. WE ARE FULL AND THUS WE ARE JOLLY! Except Alyce has diabetes (in small amounts), which means that she doesn't have the chemical that tells her she's had enough food. That means she's led a life being totally unfulfilled and has no chance of being there. This is sad. 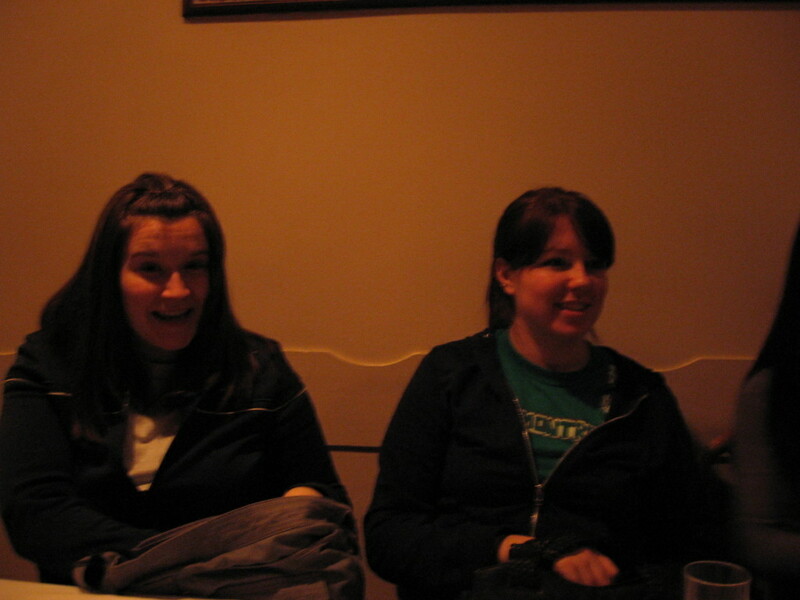 But Alyce and Catherine are still excited because they ate delicious Indian food for under $20. 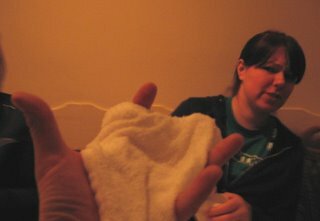 BUT SHE IS VERY AFRAID OF THE MOIST TOWEL. So that should catch us up with ridiculous ramblings and journeying. Love, me.